Michelin | faim? oui oui!!!!!! Right after landing in Cusco, we immediately went down to Sacred Valley. 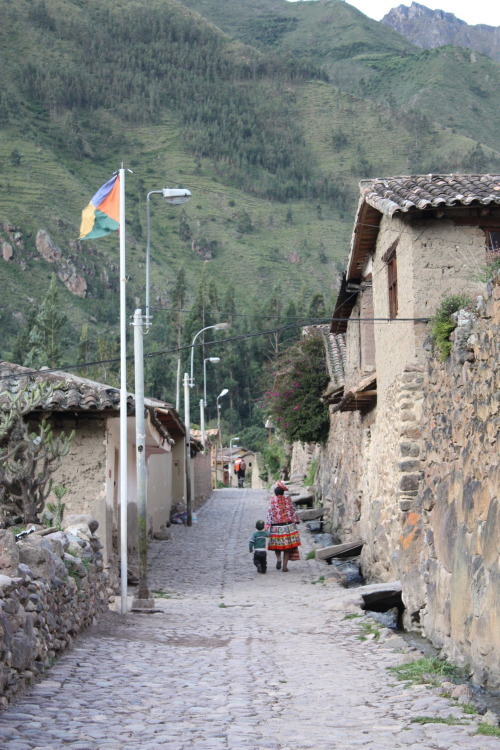 Since it is at a lower elevation than Cusco, we decided to stay a night at Ollantaytambo before going to Machu Picchu. 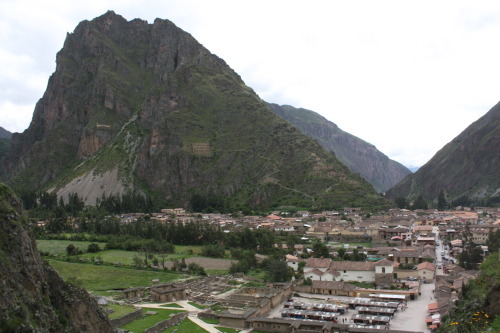 Ollantaytambo was the royal estate of Emperor during the Inca Empire and has the famous Ollantaytambo ruins. The above picture is a picture of the town taken from the ruins. Most of the stones here are laid down during the Inca era! 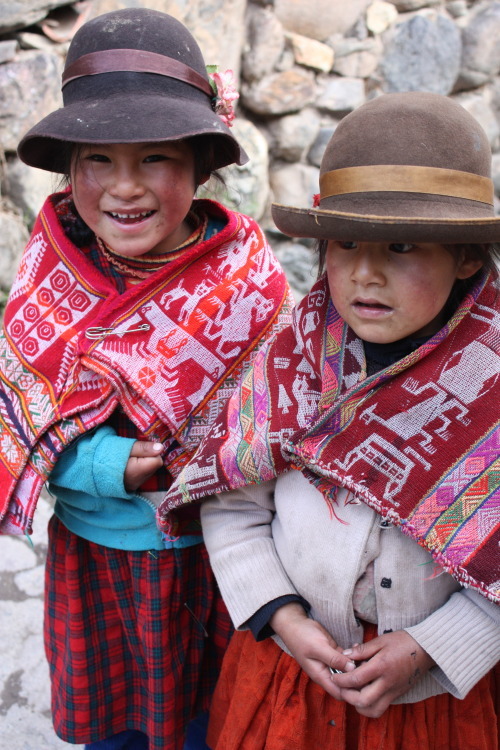 This photo is my favourite photo I took on the trip… the girls are so cute! they gave us a map of the recommended restaurants in town. 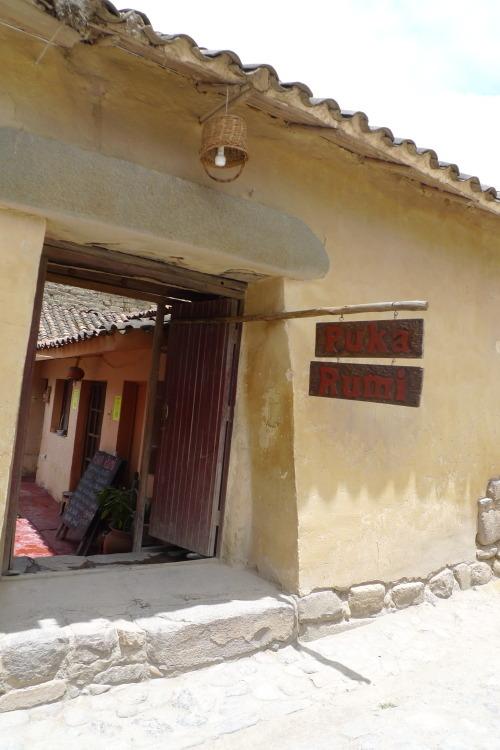 For our first meal in town, we picked Puka Rumi… apparently, it has the best burrito! 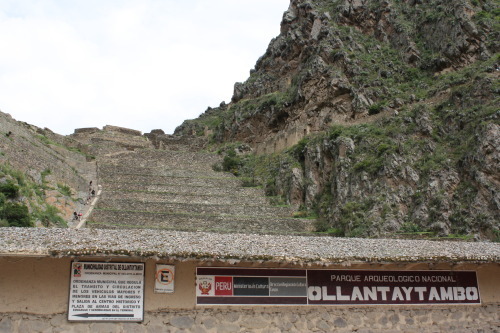 It’s located next to the entrance to Ollantaytambo ruins. 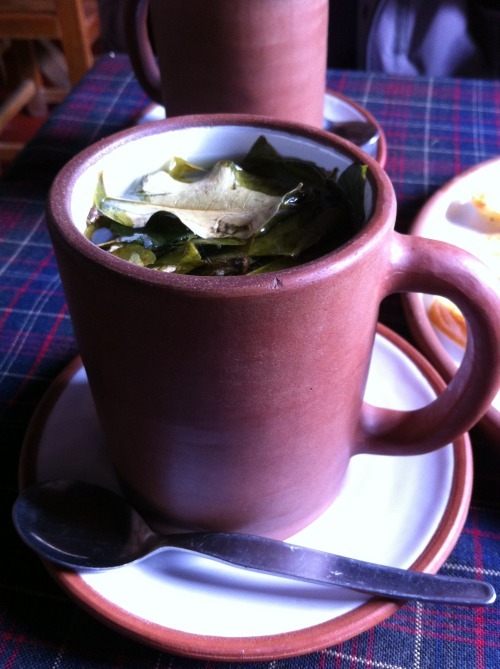 mate de coca (coca tea)… apparently this helps/prevents altitude sickness and this was my drink staple at every meal. Coca tea leaves are the source for cocaine base anhd it’s supposedly illegal in the US unless it’s decocainized. But hey! 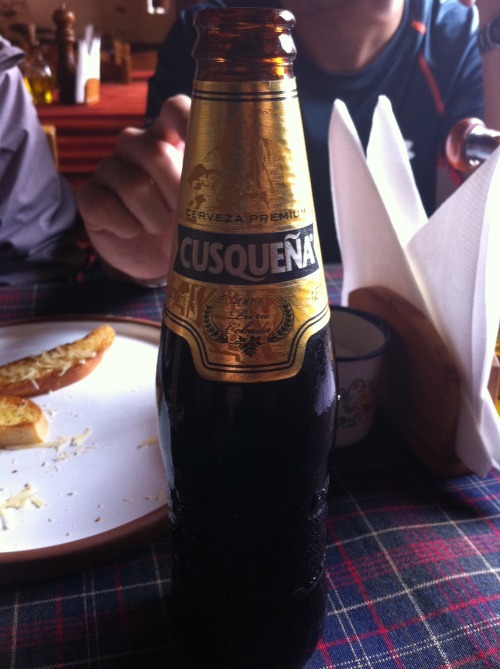 it’s legal in Peru and Bolivia! 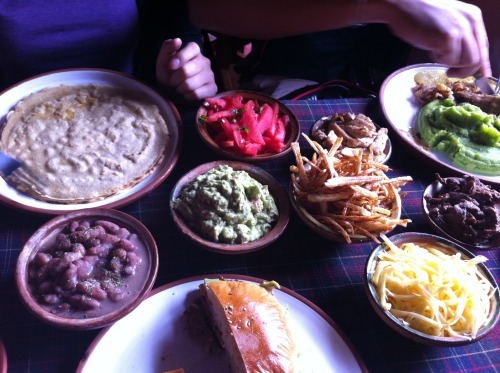 At this point, I was still having stomach flu so I shared a burger and burritos with my friends. DIY burritos! Look at the generous spread of toppings! I put so much toppings that I couldn’t wrap it! 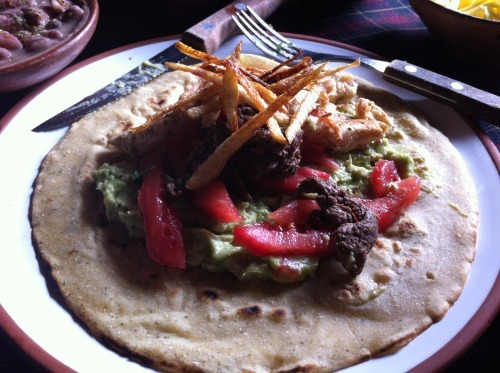 my other friend ordered grilled alpaca…. 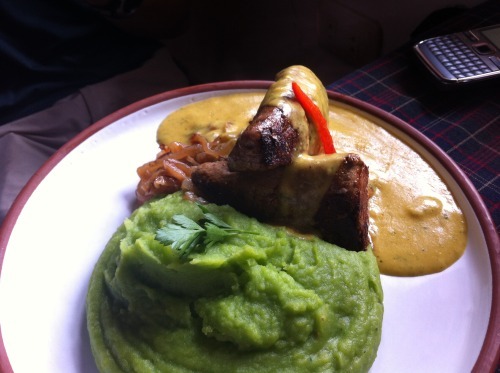 surprisingly, this was really tender and was one of the foodie highlights… the green pea mash was pretty good too! Even though we only stayed in Ollantaytambo for a day, it was one of the most memorable stays of the trip because I loved the small town Peruvian experience. Hong Kong had its first ever Restaurant Week this year from July 11- 17. 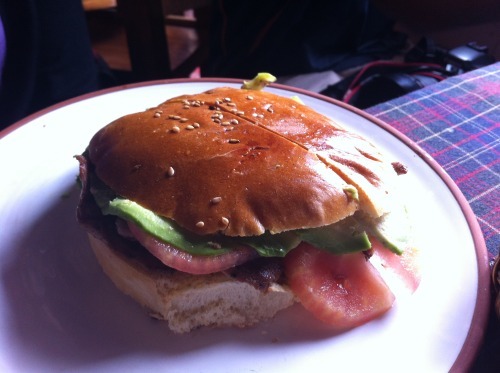 There were 2 restaurants I really wanted to go to: Bo Innovation and Fofo by El Willy. My parents and family friends were in town so Bo Innovation should be a good choice to introduce them to Hong Kong’s culinary scene. I don’t have an American Express card, so I wasn’t able to have priority booking. 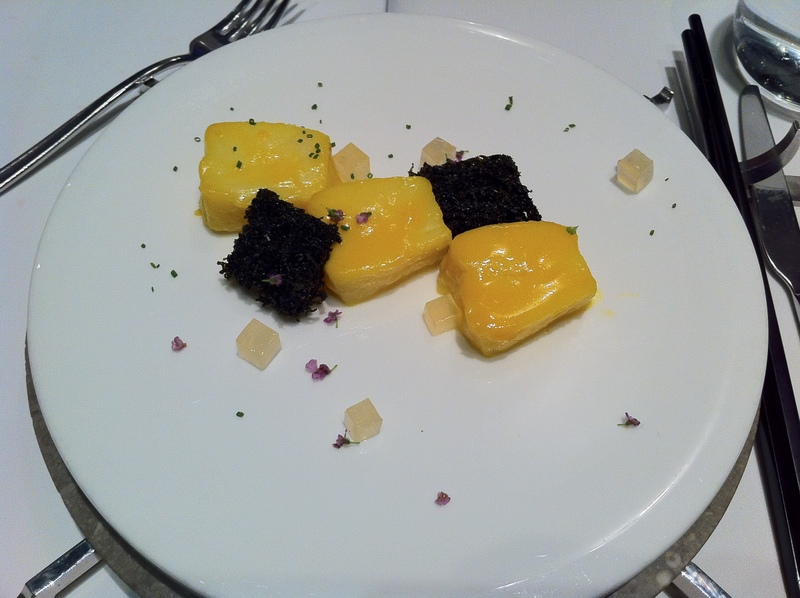 I only managed to snag a reservation at Bo Innovation (1 Michelin starred) and Azure. 3-course menus were offered at 158 HKD (lunch) and 298 (dinner) and an additional $50 for lunch and $100 for dinner per Michelin star. This is different than Dine Out Vancouver where 3-course menus are offered at $18, $28 and $38. Bo Innovation is famous for its molecular reinvention of tradition Chinese cuisine. 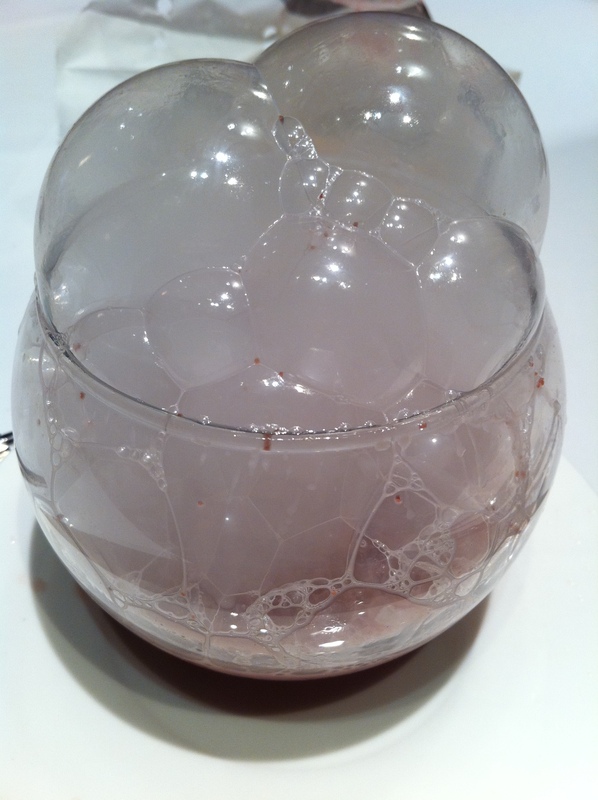 This was my first time experiencing molecular gastronomy and I embarked on a whole different foodie journey! 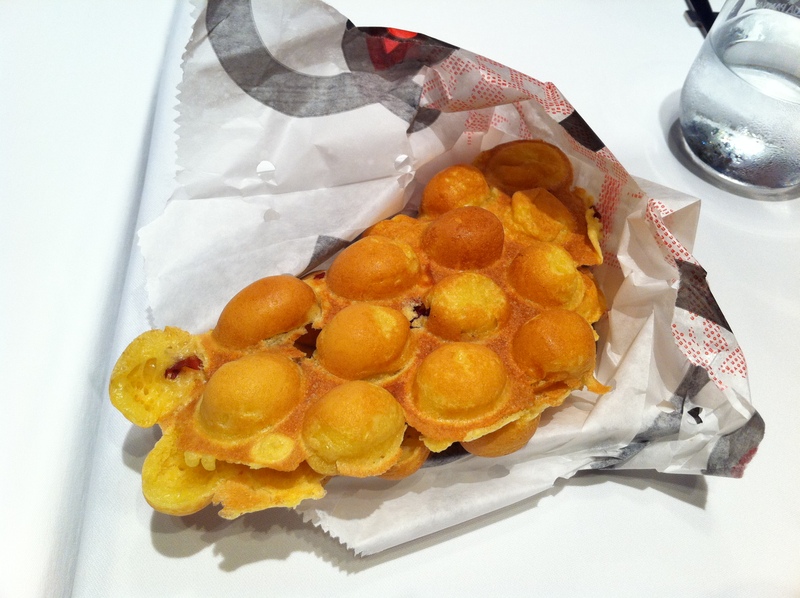 Since Bo’s also a fusion restaurant, egg waffles were served instead of bread..well, not the regular 雞蛋仔 cause these were filled with Iberico ham! 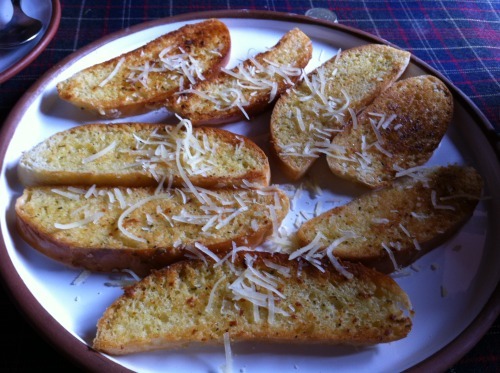 A gastro-twist on the street-vendor snack I love! 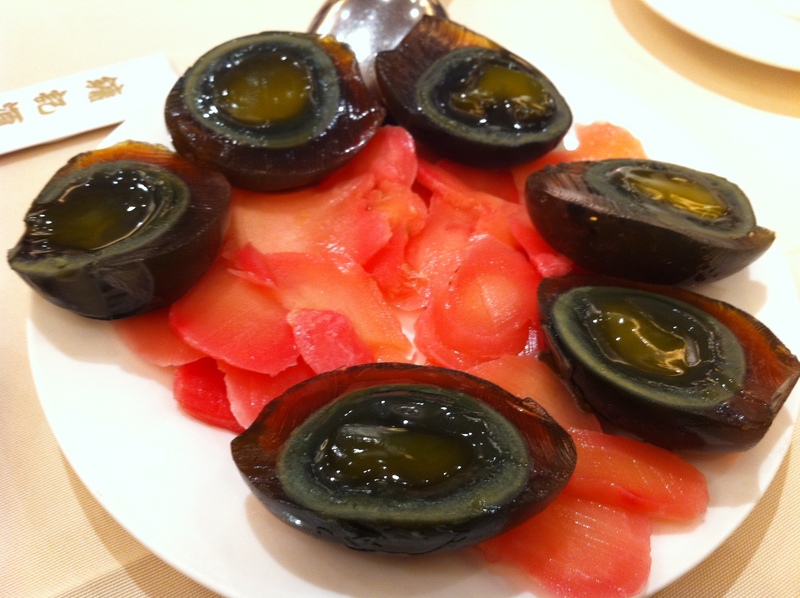 century egg pickled ginger…. Instead of serving the actual century egg with ginger (picture below), Bo opted to serve this dish by mixing liquid with dry ice! You’re supposed to eat the bubbles and it tasted exactly like the tradition century egg with ginger! foie gras “mui choy”.. this was foie gras paired with mui choy (pickled vegetable) ice-cream. 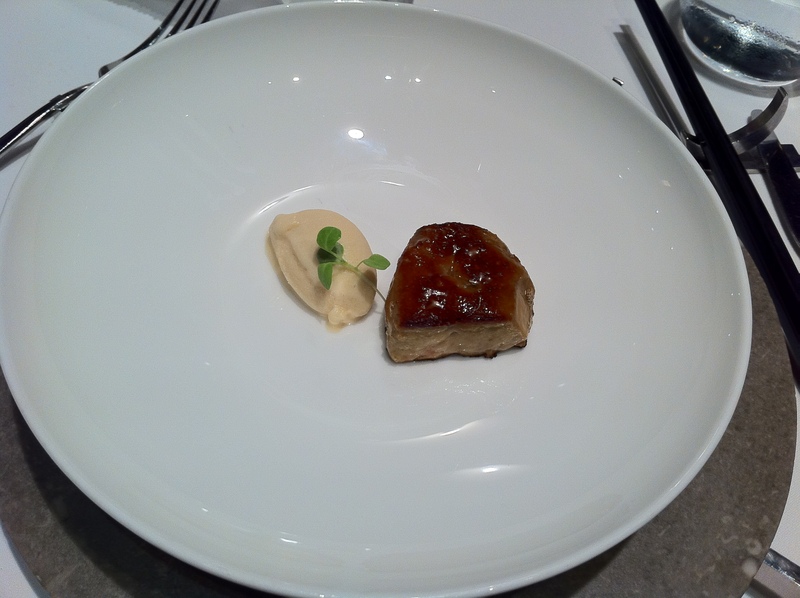 The foie gras was nicely seared so it had the “melt-in-your-mouth” texture. The ice-cream actually tasted like mui choy.. including its saltiness! It’s best to have a bit of ice-cream and foie gras in the same bite! 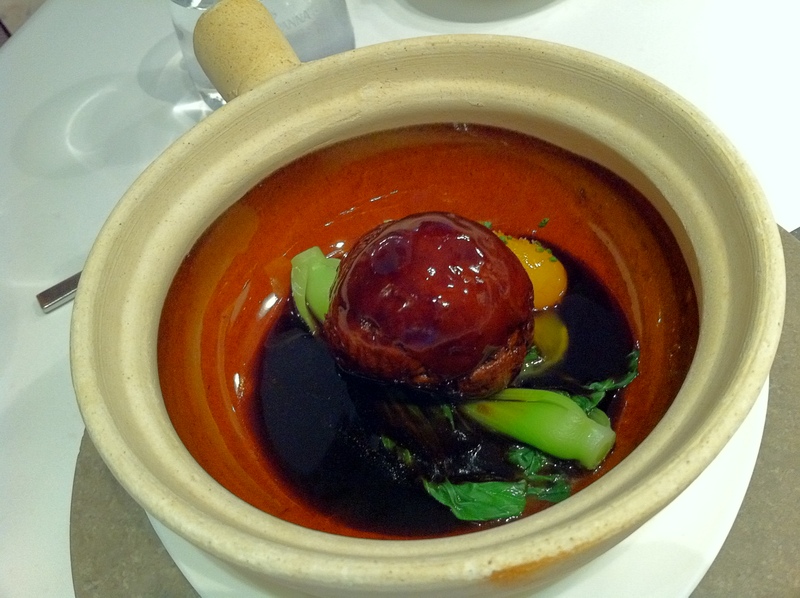 molecular xiao long bao… xiao long bao is one of my favourite food and I was amazed with this molecular version. 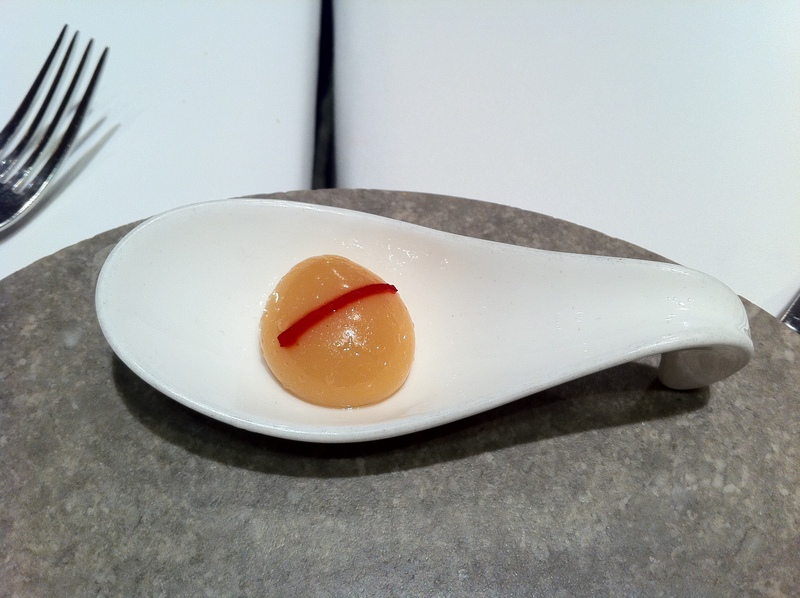 I took a bite of this jelly ball, which is topped with a single thin slice of red ginger, and it exploded in my mouth…The effect and the taste were just like the traditional xiao long bao but there’s no meat to be chewed! har mi lo mein, chili, sage… This dish is a twist of one of my favourite Chinese noodles, the shrimp roe noodles (蝦籽麵). The lo mein was tossed with chilli, sage and dry shrimp oil and you have an option of sprinkling the noodles with shrimp powder. The shrimp oil and powder made the noodles extremely flavourful. 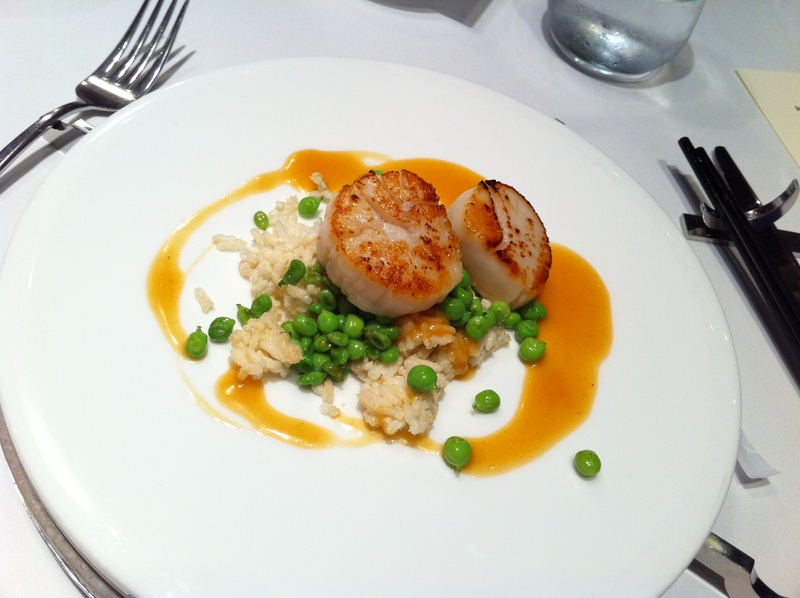 Unlike the regular menu, this dining week menu dish is served without the prawn. Next came the main courses, which you can pick either the cod, suckling pig, scallop (additional $100) or beef (additional $450). scallop crispy woba, pea, sichuan jello … this was tasty but nothing spectacular. cod saffron, miso, sauterernes, seaweed.. This was a tiny main course! Nothing special.. well, the fried seaweed tasted pretty interesting. 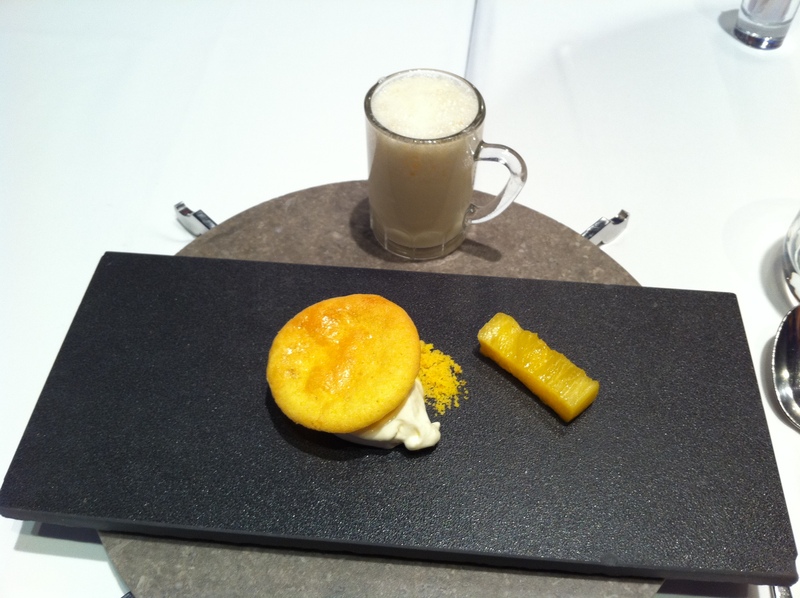 This meal was a good introduction to molecular gastronomy and I was amazed at how inventive the dishes were. The Restaurant Week menu price is a real deal compared with the regular price but as a dining week lunch, $300 is a bit too much. One thing I noted was only 3 tables out of the restaurant were designated for Dining Week and had only 1 seating for lunch.. which is probably why Bo was fully booked nearly right away. The next Hong Kong Restaurant week is Feb 20-26 and hopefully, I’ll be able to get a reservation for Bo Innovation for dinner and Fofo!